📅 January 2019 February 15, 2019 by Bruno B. 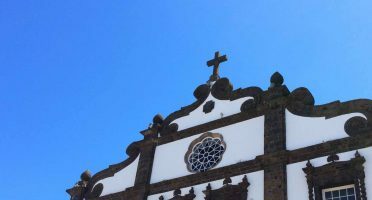 Everything you need to know before going to the hot springs in São Miguel. Which one is the right one for you, what to bring, and more useful tips! 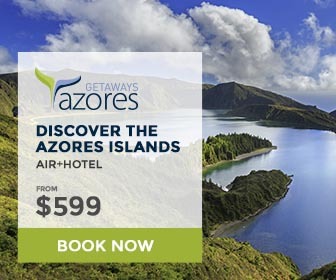 In the middle of the North Atlantic ocean, São Miguel, Azores is a paradise of meadows, coves, beaches, crater lakes, and… beautiful hot springs. 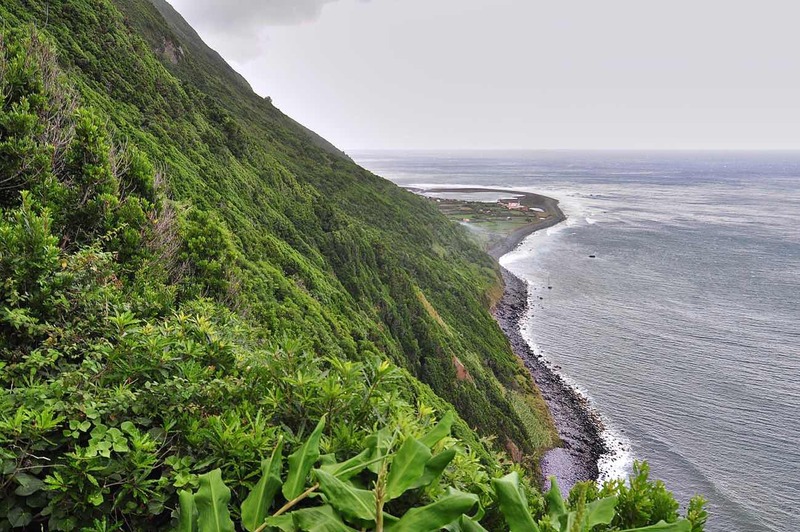 In São Miguel island alone, there are 3 main active volcanic complexes: Furnas, Fogo, and Sete Cidades. Volcanoes create heat which needs to escape to the surface somehow. Hot springs are perhaps the most beautiful way this happens. 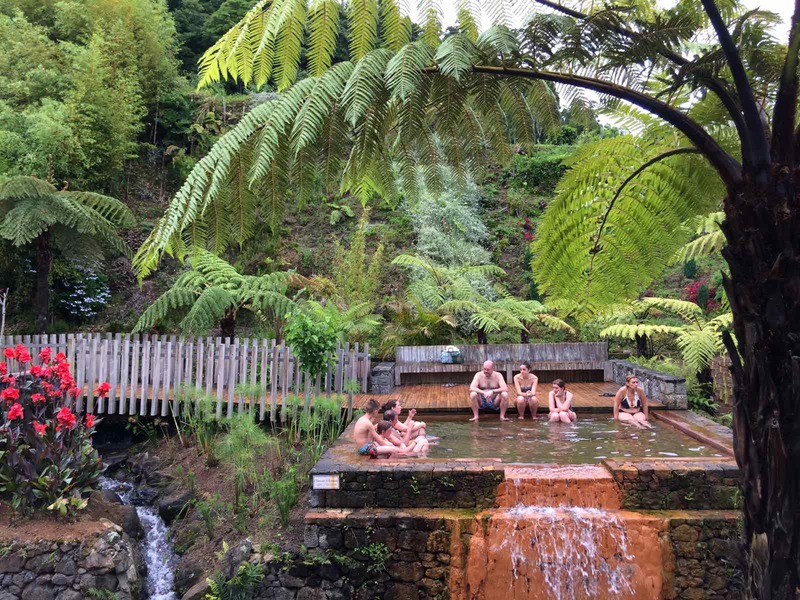 While a major highlight of the island, visiting one or two thermal springs should be enough to have the experience during your São Miguel itinerary. But which is the best hot spring for you? 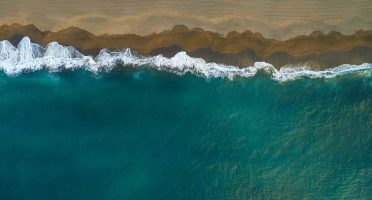 What to know before visiting thermal springs in Azores? 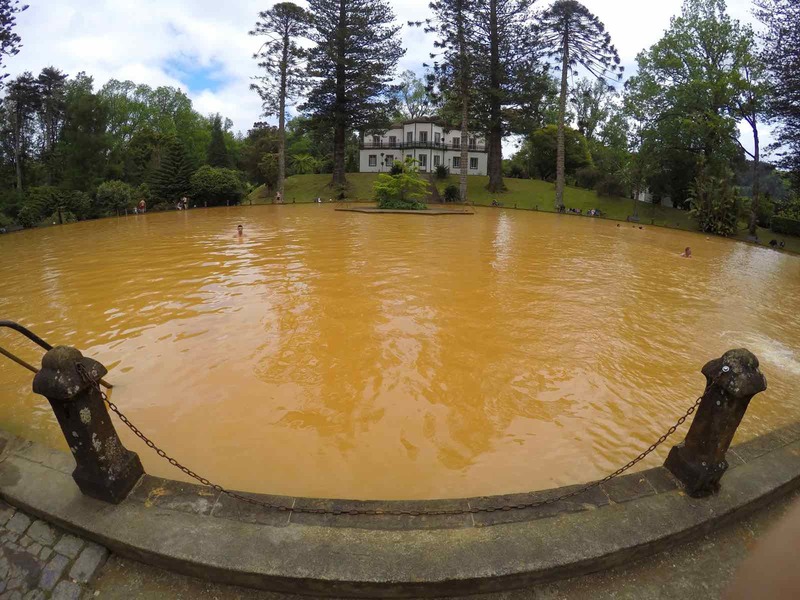 Here are the important things to keep in mind before you swim in a hot spring in São Miguel island. A swim in hot water feels better when it’s actually colder outside. Choose the most cloudy or cold day (or evening!) to visit a hot spring. Pets, smoking, drinking and the use of soap/detergents is strictly forbidden. Do not enter the water if you recently dyed your hair or are using nail polish – it may change colors! Avoid using any kind of jewelry as they may tarnish, especially gold or silver. Light swimwear may also stain due to the high iron content in the water. Use dark, preferably old, swimwear and wash it before it dries. Same with your towel! Consult with your doctor beforehand if you have low blood pressure or if you’re pregnant. A bit of an obvious one, but don’t swallow the water. This also goes without saying, but be aware you’re sharing a public space with others who are there to relax so be careful not to disturb the ones around you. Ponta da Ferraria is a small cove in the western tip of the island. Surrounded by gigantic lava rock cliffs, the ocean water here is warmed up by a geothermal natural spring beneath. It’s the only hot spring of the volcanic complex of Sete Cidades. Be careful on the peak of the low tide as it can get VERY HOT in some spots. However, if you go on the peak of high tide you won’t feel the warmth of the spring at all. Temperatures usually range from 18-30 degrees Celsius. There are also housed baths, a spa and an outdoor swimming pool nearby. Overall, the perfect end of day exploring the Sete Cidades area. ⏱ Hours: You can swim in the ocean 24h/day. The spa is open from Tuesday to Sunday, from 11 am to 7 pm.  How much: Entrance is free to swim in the ocean. Check their website for prices of spa treatments.  Tip: Check tide time times before going to Ferraria to time your visit well. Note: it is usually a LOT more crowded than this. Poça Dona Beija is a set of 5 open-air thermal pools, at different temperatures, ranging from 25 to 39 degrees Celsius. Despite being located in the Furnas village, it sits in the middle of a jungle-like scenario perfect to unwind. This spot gets busy all-year round but it can get especially crowded during summer. It’s one of the most popular among both locals (me included!) and tourists to relax after a day in Furnas and Nordeste. ⏱ Hours: Daily from 7am to 11pm.  How much: 6 EUR for adults, 4 for children.  Tip: There are lockers and hot showers available at an extra price. Check a list of the 23 favorite luxury, family, budget hotels and guesthouses in my home island. The most premium hot spring in the island. 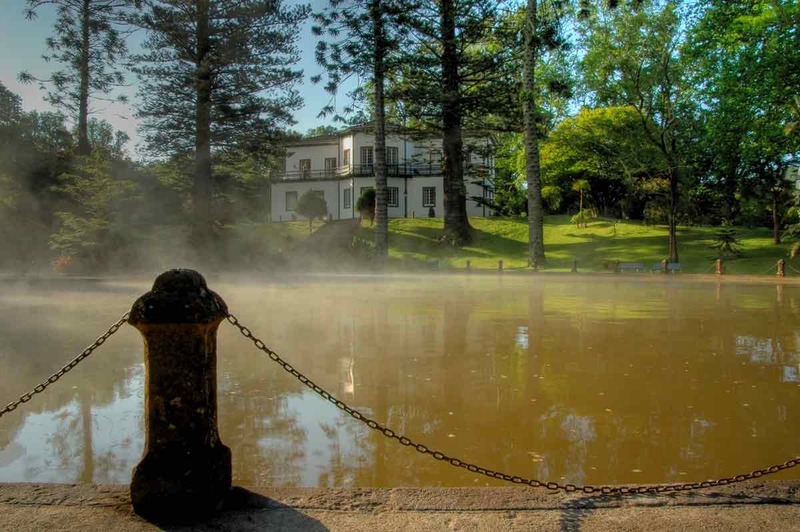 Terra Nostra is a famous landmark in Furnas and is a mix of hotel, restaurant, gardens, and of course, outdoor thermal pools. There is a massive main pool and two secondary pools with water temperatures ranging from 35 to 40 degrees Celsius. With lots of space to swim around, this is definitely one of the most chilled hot spring experiences in São Miguel. Apart from the pools, the collection of plants in Terra Nostra Gardens is sublime and creates one of my favorite environments to relax in the island. They even got different recommended itineraries for each time of the year. 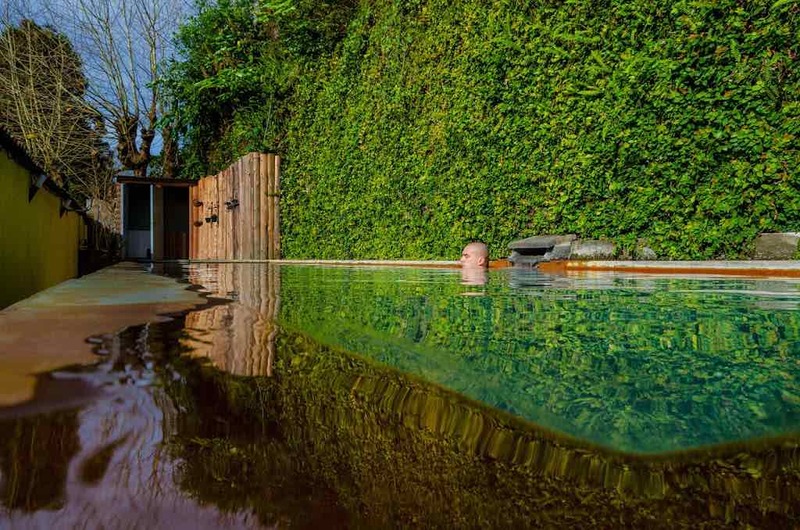 In case you are too relaxed to go home, Terra Nostra Garden Hotel is a fantastic place to stay in São Miguel. it’s elegant, modern, and a perfect marriage with the surrounding nature. That said, you don’t need to be a guest to eat in their restaurant – pricey, but delicious – nor to visit the gardens. ⏱ Hours: Open everyday from 10am to 6pm.  How much: Entrance fee to the park where the pool is located is 8 EUR. Towels and lockers can be rented at an extra cost. Ok so I never been inside to try out the thermal pool of Furnas Boutique Hotel, so can’t really comment much. 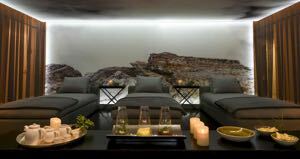 However, I’ve been inside their gorgeous location and they’re supposed to have the most complete spa experience on the island. They’ve got a special thermal spring with iron-enriched water at 59 degrees Celsius (! 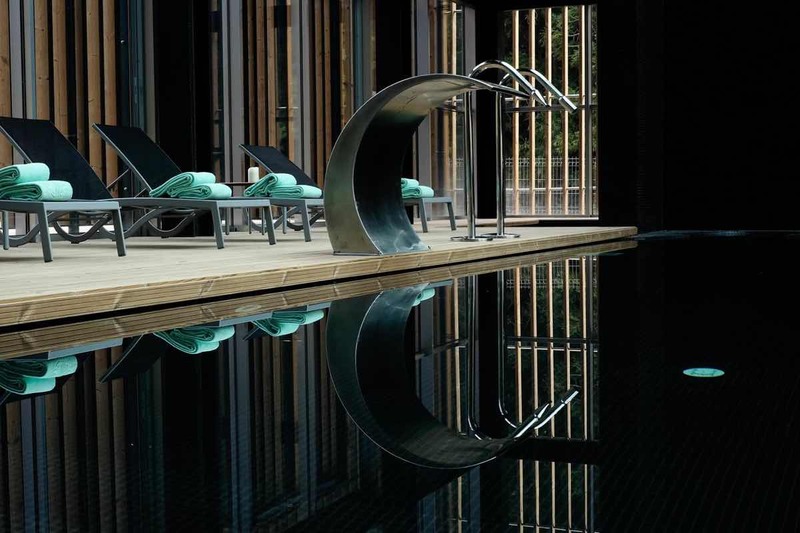 ), as well as indoor and outdoor thermal swimming pools. Pick one of the many spa treatments including special massages with Gorreana green tea and milk from Azorean happy cows. 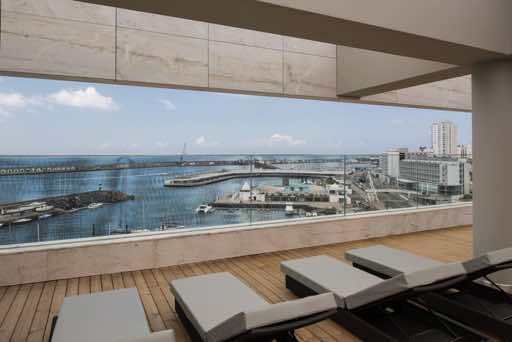 Modern and elegant, its full-wellness program and nature-inspired-interiors make it the ideal place to relax. Still unexplored by mass tourism, Termas das Caldeiras is a set of 3 pools, one of them outdoors close to the city of Ribeira Grande. You’ll need to book a massage through their spa to have access to the indoor ones, but the outside one is open for everyone who pays the small entry fee. Make no mistake: this is a SMALL thermal spring. On the plus side, it’s likely that it doesn’t get too crowded during your stay. This is one of the best choices of hot springs on the island if your goal is to fully relax in a laid-back environment. ⏱ Hours: Open everyday from 10am-10pm.  How much: Entrance to the outdoor pool is 3 EUR. Check prices of other spa treatments.  Tip: The Salto Do Cabrito trail starts just 2 min away and this is a great spot to chill afterwards. Located the Fogo volcanic complex, Caldeira Velha is just a 10-min drive away from Lagoa do Fogo, making it a soothing Lagoa do Fogo finale. Caldeira Velha is actually a natural park – ok, more like a Jurassic jungle – with a pair of hot springs. The main highlight is the waterfall spring (at 20-23 degrees Celsius), at the end of the park. It’s a bigger pool with a stunning backdrop. There is also a more shallow and hotter spring (can reach 34 degrees Celsius) which can get very crowded. No wonder, it’s like a natural jacuzzi! ⏱ Hours: Open from 9h30am to 5h30pm in winter and from 09h00 – 21h00 in summertime (May-September).  How much: The entrance to Caldeira Velha Environmental Center is 8 Euros (as per 2019).  Pro tip: Parking is limited. Arrive early if you want to avoid the busiest hours. Another option is the Ribeira Grande area. 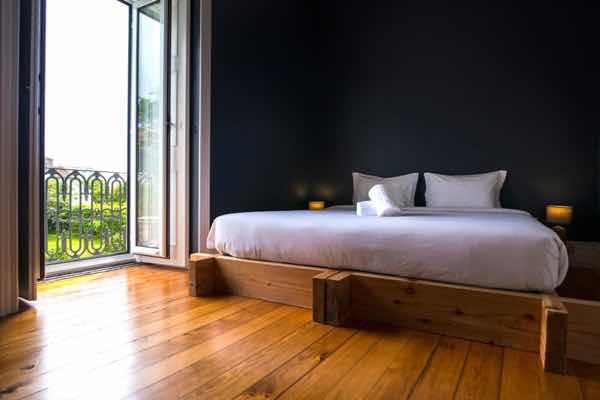 Many cool accommodations have appeared there in recent years – from budget guesthouses to high-end hotels and the city is a great hub of restaurants too. Ah and there’s a gorgeous pool on the terrace! 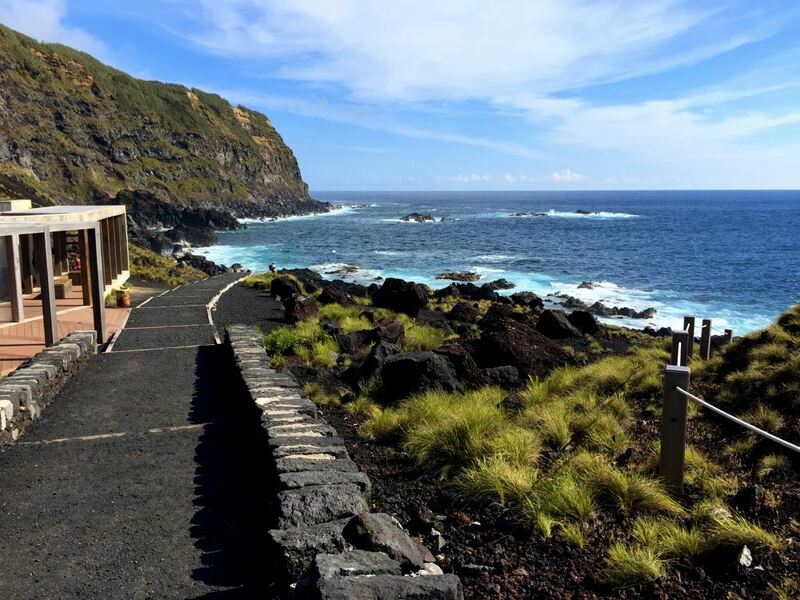 To make your life easier, you can start your search with my pre-selection of the hotels/guesthouses/villas in the island of São Miguel. 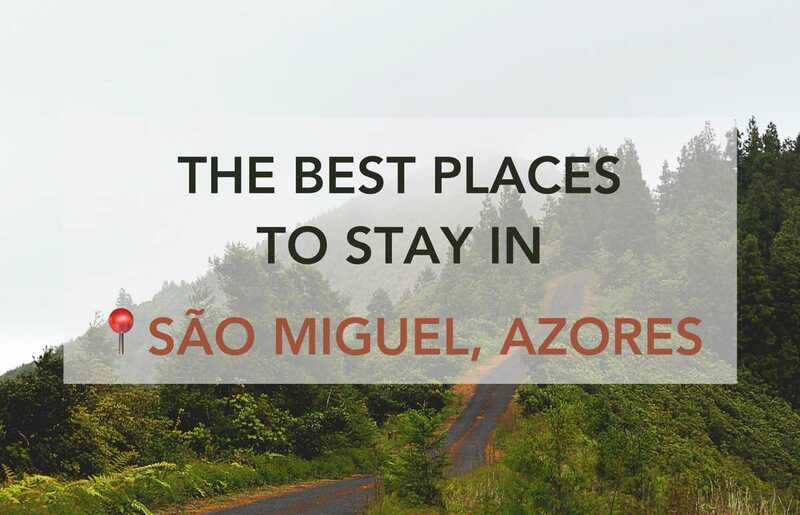 This list only includes the top-rated reviewed hotels in São Miguel, with wifi included. Hard to go wrong with these! Taxis and tours can be costly and public transportation is not reliable. So the easiest way to get around São Miguel is definitely by renting a car. Plus, a island road trip will add a sense of adventure to make your trip truly memorable. The Ponta Delgada airport is the most convenient spot to pick up your car. Most rent a car companies have physical stands at the airport, but many others will pick you up for free and take you to their offices. As you can see, there’s an incredible variety of experiences and landscapes to choose where your hot spring bath will be. Just pick your favorite(s) and enjoy the pleasures of Planet Earth. 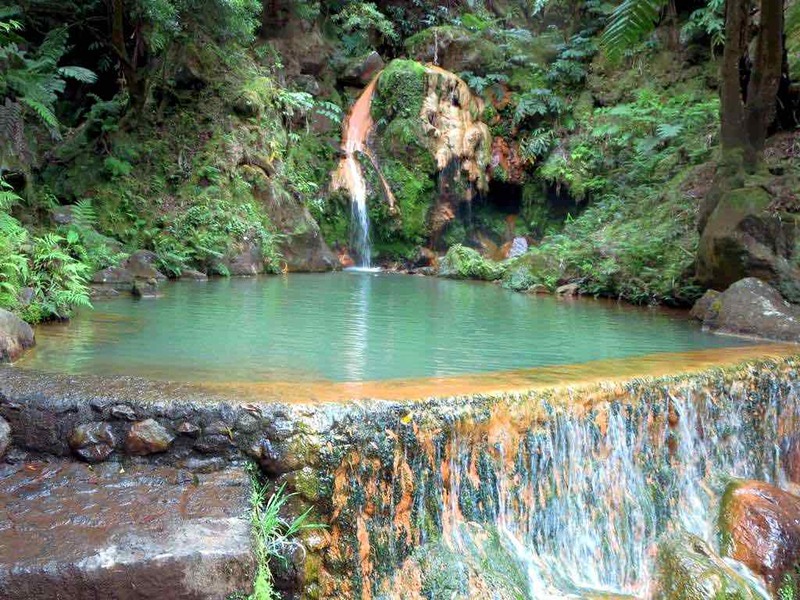 Did you visit the hot springs in São Miguel?